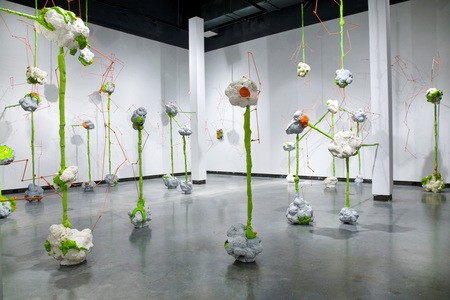 Mutated Growth combines three of my installations together into a new symbiotic whole. 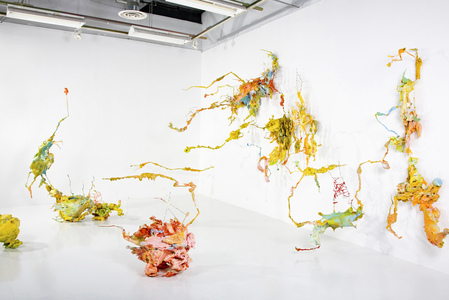 Each of the previous installations involved its own exploration while also adding to a larger conversation about biological flux and the shifting nature of living systems. The installations change and expand with each exhibition of the work and by combining the installations themselves I can take that potential for growth and transformation a step further, so the forms are always malleable – with unlimited potential to morph, change, and take on new life. 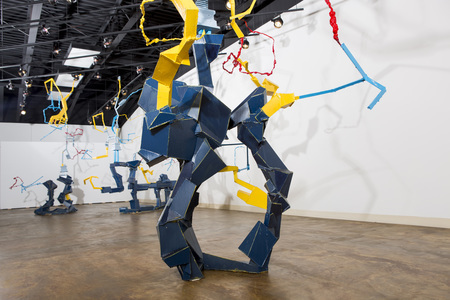 All of these installations stem from a love of materiality and an ongoing curiosity about what it means to be alive. An important undercurrent that influenced this particular work is an interest in the human manipulation of living systems, particularly advances in bioengineering and experiments that involve combining or altering the basic components of nature. On some level, I see myself as taking on a similar role – cutting and pasting with the parts and splicing my own imaginative systems together to explore ways that raw material can continuously be restructured and adapted. I see this frontier as fraught with both exciting and unsettling possibilities and while my work is imaginative, I see the work as part of a larger conversation about our complex relationship with nature and what it means to shape the world around us.